The Columbus Zoo and Aquarium accepts the Corporation of the Year Award at the Ohio Minority Supplier Development Council 2018 Annual Awards Gala in West Chester on Nov. 16. 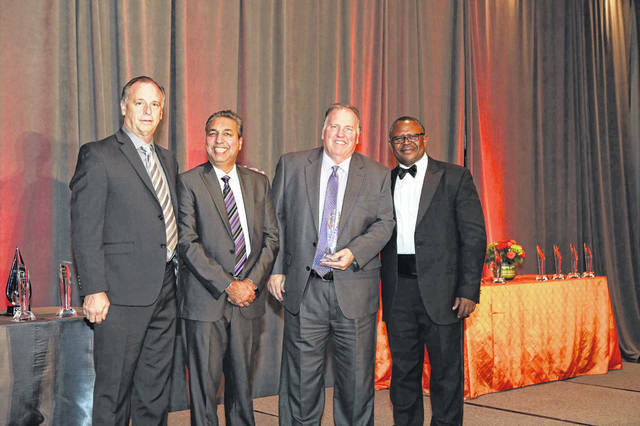 Pictured, left to right, are Tracy Murnane, Sharad Thakkar, Ph.D; Greg Bell and Christopher Che. The Ohio Minority Supplier Development Council (OMSDC) recognized the Columbus Zoo and Aquarium with its Corporation of the Year Award during the OMSDC’s 2018 Annual Awards Gala on Nov. 16 at the Savannah Center in West Chester. The Gala is OMSDC’s signature event and highlights the growth and success of minority business enterprises and the commitment to supplier diversity by the corporate members in the region. The Columbus Zoo received this highly respected award for its Supplier Diversity Program, which ensures a continued commitment to utilizing diverse suppliers for products and services purchased by the zoo, as well as providing maximum opportunity for certified diverse suppliers that include minority, disabled, veteran, and women-owned business enterprises interested in conducting business with the zoo. The award was presented by President and CEO of Che International Group Christopher Che and President of Polymer Technologies and Services, Inc. Sharad Thakkar, Ph.D., to the Columbus Zoo and Aquarium’s Executive Vice President and Chief Financial Officer Greg Bell and Director of Purchasing Tracy Murnane, who accepted the award on behalf of the zoo. “We are honored that the OMSDC has selected the Columbus Zoo to receive the Corporation of the Year Award, and we see this award both as a success for the zoo and, moreover, the business community. We are extremely proud to work with the many great minority business enterprises in Central Ohio and beyond, and we look forward to continue building upon these strong relationships and together work toward expanding these professional opportunities in the future,” said Columbus Zoo and Aquarium President/CEO Tom Stalf. Through the Columbus Zoo’s Supplier Diversity Program, the zoo searches for suppliers who can help the zoo deliver exceptional guest experiences and continue its commitment to conservation and education. The zoo also strives to form strong bonds with its surrounding communities and help women- and minority-owned businesses thrive whenever and wherever possible and ensure that diverse suppliers have a full opportunity to be considered for the zoo’s business. In 2017, the zoo purchased over $6 million worth of products and services from minority business enterprises certified by the OMSDC, ranging from commercial building construction and printing to safety equipment and architectural and engineering services.